Citrullinemia (CTLN) is part of a group of six genetic diseases known as urea cycle disorders. Each of them is characterized by a deficiency in one of the enzymes involved in the urea cycle, a sequence of biochemical reactions that takes place in the liver cells and allows the elimination of the excess of nitrogen, resulting from the breakdown of protein and other nitrogen-containing molecules. In most mammals the bulk of nitrogen is excreted as urea with urine. This substance is highly soluble and being electrically neutral, does not influence the ph when is accumulated, unlike ammonia. In the presence of citrullinemia the conversion of ammonia into urea is interrupted prematurely leading to the accumulation of a metabolic intermediate known as citrulline. Citrullinemia is an autosomal recessive disorder which causes toxic substances, including ammonia, to build up in the bloodstream. There are two main types of citrullinemia each caused by different genetic mutations and resulting in different symptoms. Generally citrullinemia determines an abnormal accumulation of citrulline in the bloodstream and urine (citrullinuria), hyperammonemia, an increase of orotic acid, a lack of arginine and a damage of liver function. The incidence of u urea cycle disorders is estimated to be at least 1: 30,000 births; type 1 citrullinemia is the most common form of the disorder, it occurs in 1: 57,000 births. Type 2 citrullinemia is found primarily in the Japanese population, where it occurs in 1:100,000-1:230,000 individuals. Type 2 citrullinemia also been reported in people from East Asia and Middle West. Morbidity and mortality rates are high. Because of the mode of transmission, autosomal recessive, males and females are equally affected. Frequency and distribution in East Asia of 12 mutations identified in the SLC25A13 gene of Japanese patients with citrin deficiency; 2005. Identification of 13 novel mutations including a retrotransposal insertion in SLC25A13 gene and frequency of 30 mutations found in patients with citrin deficiency; 2008. Citrullinemia type 1 is characterized by a clinical spectrum that includes an acute form or ‘‘classical’’ form that occurs in newborn babies, a late-onset form and a form that occurs in woman during pregnancy or post partum. Acute form; infants appear normal at birth, but they develop very quickly hyperammonemia and become progressively lethargic, showing no interest in food, they often vomits, and may develop signs of increased intracranial pressure (ICP). If immediate medical attention does not occur, hyperammonemia and accumulation of other toxic metabolites, such as glutamine, result in ICP, increased neuromuscular tone, spasticity, ankle clonus, seizures, loss of consciousness, and death. Fifty-six percent of infants with classic citrullinemia type I are symptomatic by four days after birth and 67% by one week after birth. CT findings in the infantile form of citrullinemia; 2002. Late-onset form; could be milder than the acute neonatal form. It is characterized by significant episodes of hyperammonemia, the neurologic symptoms may include intense headache, scotomas, migraine-like episodes, ataxia, slurred speech, lethargy, somnolence, respiratory alkalosis and tachypnea. If the disorder is underestimated, the consequences are an increase of intracranial pressure and neuromuscular tone, spasticity, ankle clonus, seizures, loss of consciousness, and death. Liver failure is recently emerging as an initial presentation of citrullinemia type 1. Transient fulminant liver failure as an initial presentation in citrullinemia type I; 2011. Women with onset of severe symptoms during pregnancy or in the postpartum period have been reported. First manifestation of citrullinemia type I as differential diagnosis to postpartum psychosis in the puerperal period; 2010. Citrullinemia type 2; when signs and symptoms appear in adulthood(ages 20-50 years),the disorder is called adult-onset type 2 citrullinemia, in some cases the disease affects infants suffering from a liver disease known as neonatal intrahepatic cholestasis caused by citrin deficiency (NICCD). This liver condition is known as neonatal-onset type II citrullinemia and in many cases it resolves within a year. If this does not happen the individual, before to develop the characteristic features of adult-onset type II citrullinemia, experiences a state of apparent health characterized by fatigue, growth retardation, hypoglycemia, and pancreatitis. Mitochondrial aspartate glutamate carrier (citrin) deficiency as the cause of adult-onset type II citrullinemia (CTLN2) and idiopathic neonatal hepatitis (NICCD); 2002. Neonatal intrahepatic cholestasis caused by citrin deficiency (NICCD) as a cause of liver disease in infants in the UK; 2009. NICCD: it is characterized by fatty liver with hepatomegaly and parenchymal cellular infiltration associated with hepatic fibrosis, low birth weight, growth retardation, hypoproteinemia, decreased coagulation factors, hemolytic anemia, mild liver dysfunction and hypoglycemia. NICCD is generally not severe, symptoms typically resolve by one year of age with treatment. In the second or later decades, some individuals with citrin deficiency develop severe CTLN2 with neuropsychiatric symptoms. CTLN2: it is characterized by hyperammonemia, nocturnal delirium, aggression, irritability, hyperactivity, delusions, disorientation, restlessness, drowsiness, loss of memory, flapping tremor, convulsive seizures, and coma. Many people with ctln2 shows a strong preference for protein-rich and/or lipid-rich foods and an aversion to carbohydrate-rich foods including rice, juice, and sweets. In patients with type 1 citrullinemia who are symptomatic, the measurement of blood ammonia levels is the primary laboratory test in diagnosis. Next step is, quantitative measurement of blood amino acid levels. Citrulline levels will be elevated in the blood, while arginine levels will be low and argininosuccinic acid is absent. Orotic acid levels will be elevated in the urine. Measurement ASS1 activity in cultured skin fibroblasts can provide an unequivocal biochemical diagnosis. Molecular genetic testing of ASS1, the only gene in which mutation is known to cause citrullinemia type I, is clinically available. In the case of citrin deficiency, this will cause increased blood or plasma concentration of ammonia, plasma or serum concentration of citrulline and arginine, plasma or serum threonine-to-serine ratio, and serum concentration of pancreatic secretory trypsin inhibitor. Identification of biallelic mutations in SLC25A13, the only gene in which mutations are known to cause citrin deficiency, confirms the diagnosis. Pre-natal diagnosis is possible, using amnios or analysis of chorionic villi. In neonates who are jaundice and have normal or mildly elevated ammonia levels, hypercholesterolemia suggests citrin deficiency. The urea cycle allows to eliminate the excess of nitrogen, resulting from the breakdown of protein and other nitrogen-containing molecules. Part of the cycle is mitochondrial; mitochondrial dysfunction can prevent urea production and causes hyperammonemia. Citrulline can be metabolized outside the liver,ASS1 is expressed in the brain, kidney, and skin fibroblasts. The body is unable to correct the defect by conversion of citrulline to arginine, as it occur can under normal circumstances. The reaction catalyzed by ASS1 does not occur in an effective manner, this results in a lower production of urea by about fifty percent, therefore individual is prone to develop hyperammonemia. In vivo evidence in rat brains suggests that accumulated citrulline and ammonia hinders the antioxidant capacity of the organ. L-citrulline added to the cerebral cortex reduced the 30-day-old rat brains’ total radical-trapping antioxidant potential, the total antioxidant reactivity, and specific activities of catalase, superoxide dismutase, and glutathione peroxidase. Oxidative stress is most likely correlated with the neurological symptoms of citrullinemia. Regarding the pathophysiology of the disorder caused by the mutation of the gene coding for the citrine, it has not been defined yet clearly. Citrullinemia type 1 is associated with mutations in the ASS1 gene, it encodes for an enzyme known as argininosuccinate synthase. 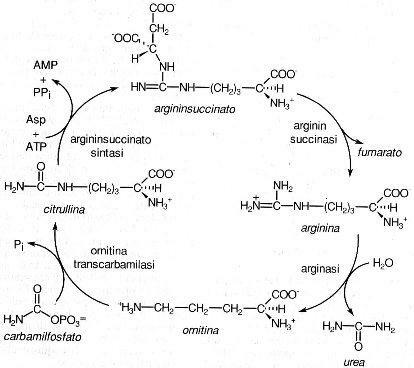 This enzyme synthesizes the argininosuccinate (argininosuccinic acid) using as reagents a mole of citrulline, one of aspartate and an ATP-molecule. The mutations reduce the activity of the enzyme, this causes the accumulation of nitrogen in the form of ammonia in the bloodstream, with serious consequences for the nervous system. ASS1 mutation leading to citrullinemia I in a Chinese Han family; 2011. Mutations and polymorphisms in the human argininosuccinate synthetase (ASS1) gene; 2009. Identification of 16 novel mutations in the argininosuccinate synthetase gene and genotype-phenotype correlation in 38 classical citrullinemia patients; 2003. Citrullinemia type 2 is associated with mutations in the SLC25A13 gene, it encodes for a protein called citrin, also known as Calcium-binding mitochondrial carrier protein Aralar2) This protein is mainly expressed in liver, kidneys and heart where it functions as a carrier for an amino acid called glutamate inside of the mitochondria and the amino acid aspartate outside of the mitochondria, as part of a process called the malate-aspartate shuttle. This molecules are used in the production and breakdown of simple sugars, the production of proteins, and the urea cycle. Molecules transported by citrin are also involved in making nucleotides. Mutations in the SLC25A13 gene prevent cells from making any functional citrin, this condition inhibits the urea cycle and disrupts the production of proteins and nucleotides. The gene mutated in adult-onset type II citrullinaemia encodes a putative mitochondrial carrier protein; 1999. Identification of two novel mutations in the SLC25A13 gene and detection of seven mutations in 102 patients with adult-onset type II citrullinemia; 2000. Complications are neurological, including mental retardation, acute hyperammonemic coma, and death. Association between citrullinemia and a particular type of cancer has been shown. Hepatocellular Carcinoma Associated with Adult-Type Citrullinemia; 2000. NICCD: The symptoms in most children with NICCD resolve by 12 months after birth following supplementation with fat-soluble vitamins and use of lactose-free formula or formulas containing medium-chain triglycerides. Liver transplantation for an infant with neonatal intrahepatic cholestasis caused by citrin deficiency using heterozygote living donor; 2010. Citrin deficiency and current treatment concepts; 2010. CTLN2: In the past the most successful therapy has been liver transplantation, which prevents episodic hyperammonemic crises, corrects the metabolic disturbances, and eliminates preferences for protein-rich, this situation starts to change since introduction of arginine and sodium pyruvate. Administration of arginine: effective in decreasing blood ammonia concentration, reducing calorie/carbohydrate intake, increasing protein intake improves hypertriglyceridemia. Gene therapy has been proposed but today it has not been developed yet. Patients who have experienced a long period of hyperammonemia may have brain damage, children who start treatment before experiencing symptoms may develop normally even if for some children the treatment does not prevent the onset of some neurological symptoms.